Medical Wave is committed to providing robust education and information to you the patient about how non-invasive pressure wave technology works. Pressure Wave/Shockwave Technology can successfully address acute and chronic pain such as: Knee Pain, Heel Pain , Foot Pain, Ankle Pain, Hamstring Pain, Back Pain, Neck Pain, Shoulder Pain , Elbow Pain, Wrist Pain and Hand Pain. It is also used to address sports injuries and much more. Beneficial effects are often experienced after only 1 or 2 treatments and there is no downtime. The non-surgical therapy for pain eliminates pain and restores mobility, thus quickly improving patients’ quality of life. Learn more about how Pressure Wave Therapy can address your pain, accelerate your healing and optimize your health. Pressure Wave/Shockwave Technology can be utilized to effectively treat a wide variety of conditions including but not limited to the following : Knee Pain , Heel Pain , Foot Pain, Ankle Pain, Achilles, Planter Fasciitis, Hamstring Pain, Back Pain, Neck Pain, Shoulder Pain, Elbow Pain, Wrist Pain, Hand Pain, Tennis Elbow, Sports Injuries, TMJ and much more. Heel pain is typically the result of overuse, but can be caused by a major injury. Heel pain usually occurs on the back or underside of your heel. Ankle pain or a sprain is often the result of a forceful twisting of the ankle causing a tear of ligaments in the ankle, in which no bones are broken. Heel pain on the bottom, front edge of the heel. Tenderness over the bottom of the foot. Pain, to varying degrees, when walking, which is usually worse in the morning and improves throughout the day. Ankle pain, swelling, bluish discoloration, pain with walking, slight increased warmth to the injured area. Pressure Wave Technology also known as Shockwave and EPAT, Extracorporeal Pulse Activation Technology is an innovative, non-invasive and effective way to treat pain. To locate a physician in your area that utilizes Pressure Wave Technology contact us. Calf pain in the lower leg is often a result of inflammation of the tendon that extends from the lower calf to the heel. Pain is typically located at the back of the ankle and worsens with walking. Shin pain can result from overuse of the leg. The pain can arise from inflammation of the bone, the muscle or connective tissue. The most common causes are ill-fitting shoes, over training, and/or running on hard surfaces. Calf pain or swelling in the back of the ankle, decreased ankle movement. Painful inflammation of a tendon or joint which can be the result of overuse or overstretching of the tendon, trauma, infection or inflammatory diseases. Pain and tenderness along a tendon. Pain is worse with movement or activity, redness of the area over the tendon when there is inflammation. Painful inflammation of a tendon or joint in your pelvis or hip area which can be the result of overuse or over stretching of the tendon, trauma, infection or inflammatory diseases. Joint and/or tendon pain, swelling, redness, increased warmth, decreased motion. Pain is worse with movement or activity. Back pain can be the result of a strain (a stretched or torn muscle injury) or from a sprain (an over-stretched or torn ligament). It can also occur over time as a result of gravity and normal use. A dull or aching pain, pain radiating down the leg, decreased flexibility, difficulty moving, pain with movement, and occasional numbness and weakness. Pain can be constant or intermittent, stay in one place or radiate to other areas and may be a dull ache or a sharp piercing or burning sensation. Painful inflammation of a tendon in the finger or wrist as a result of over use or over stretching of the tendon, trauma, infection, or inflammatory diseases. Pain due to compression of the median nerve in the wrist. Wrist pain, hand pain, numbness of the thumb and/or fingers. Pain and tenderness along a tendon. Pain worse with movement or activity. Redness of the area over the tendon where there is inflammation. Pain in the elbow or am caused by the inflammation of a tendon or joint. Pain, decreased motion, swelling, redness and tenderness at the site. The pain may become worse with bending the wrist, twisting the forearm down, or grabbing objects. 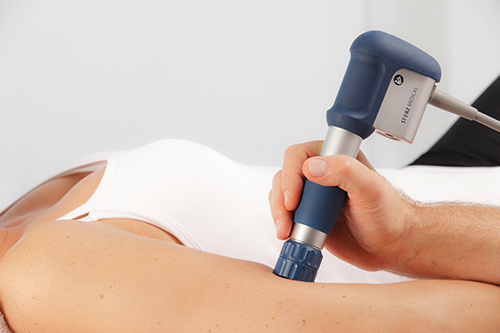 Pain and loss of range of motion of the shoulder caused by scarring and swelling of the shoulder tendon or joint. Pain can occur after a shoulder injury or after prolonged immobilization of the shoulder. Pain, decreased motion, swelling, redness and tenderness at the site. Pain with reaching, lifting and overhead activities. Tenderness may be experienced through the front, side and back of the shoulder. With age, patients may experience some pain as a result of wear and tear of the neck joints. Some experience more intense pain the nerves, ligaments and musclesare or have been irritated. Neck pain which often increases with movement. Stiffness, numbness, and weakness. Limited range of motion, headache, neck pain, stiffness of neck muscles. Not all pressure wave/shockwave devices are the same. Medical Wave provides the world's most advanced pressure wave technology to leading healthcare professionals around the country. Manufactured in Switzerland by world renowned Storz Medical, with 75 years of medical research and development behind it their device is the gold standard of pressure wave technology and demonstrates a 91% success rate as per clinical studies. Learn about physicians that provide pressure wave/shockwave therapy utilizing the Storz Medical Pressure Wave device by reviewing our physician gallery or contact us to find a pressure wave physician. Pressure Wave/Shockwave is an extremely successful treatment for a wide range of conditions reporting a 91% success rate as per clinical studies. 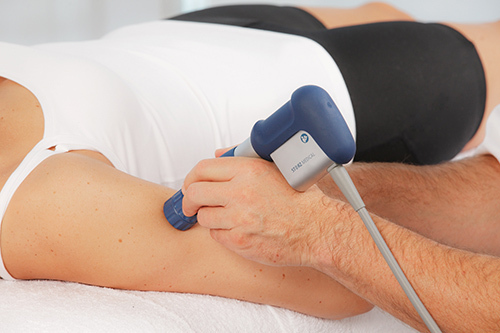 Globally, millions of patients have benefited from this pressure wave and shockwave therapy. 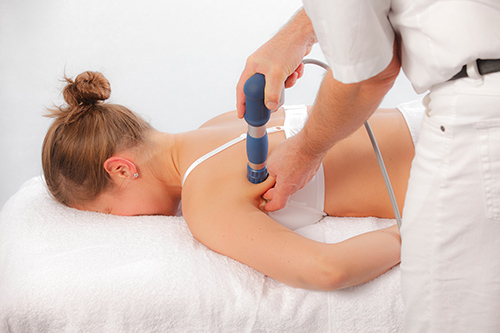 A: Pressure wave therapy is a non-invasive modern and highly effective treatment method: high-energy sound waves are introduced into the painful areas of the body. Pressure wave technology accelerates the healing process in the body by stimulating the metabolism and enhancing blood circulation to regenerate damaged tissue. Strong energy pulses are applied to the affected area. These pulses occur for short periods of time, creating micro-cavitation bubbles that expand and burst. The force created by these bubbles penetrates tissue and stimulates cells in the body that are responsible for bone and connective tissue healing. A: Pressure Wave treatment is noninvasive. Gel is applied to the treatment area; pressure waves are then released through the applicator as it is moved over the treatment area. A: The number of sessions needed depends on the condition that is being treated. Each treatment session takes between 10-15 minutes and can vary depending on the condition that is being treated. A: Most people are good candidates for Pressure Wave treatment however patients who are pregnant, have a pacemaker or current cancer are not suitable for treatment with Pressure wave Technology. Your doctor will provide you with information about conditions you may have that would affect your ability to undergo treatment. Q: Why consider getting Pressure Wave Treatment? A: Pressure Wave has a proven success rate that can be as effective or more effective than other methods such as surgery or pharmaceuticals without the with the risks, complications or long recovery times. Pressure wave treatments are non-invasive and promote accelerated recovery.